Thirteen year-old Hillary Greyson lived a charmed life until one ill-fated night changed every­thing. Hurt and betrayed by her own father, she finally confronts her mother for help, only to be turned away, criti­cized and blamed. With her innocence lost, Hillary has no one to turn to until she discovers a peculiar friend, an ally she learns to trust… learns to obey. Frustrated and angry, hurt and dejected, Hillary screams out for help, cries out for compas­sion. Already in the first book of her trilogy about Hillary Anne Greyson, Hillary: Tail of the Dog, Angel Gelique didn’t just convince me, but won me as a loyal fan! What she delivers now, with the second book, Hillary: Flesh and Blood, goes far beyond frontiers. 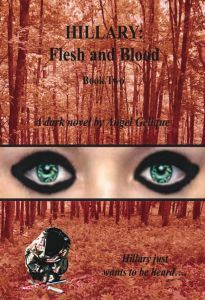 Hillary: Flesh and Blood is the prequel to Hillary: Tail of the Dog – so far, the basic plot is already known from the first book. But what Angel Gelique has created here, however, is less an inferno (though this term would sometimes be very appropriate), than a performance of decay. With a casual matter of course, I have experienced only with Ryan Hardings Genital Grinder (Deadite Press, 2012), Angel Gelique tells the story of the beginning – the genesis and creation of this Hillary Greyson. The roughly mentions from the first book are celebrated here with an almost obnoxious patience. You do not read about, you experience with – live by the side of the actual innocence, their continuous mutilation. Hillary: Flesh and Blood doesn’t keep you waiting long: you’re not getting asked for attention or getting introduced carefully – "…nice, you’re here. Welcome to hell!" At the beginning of this impression, I very consciously pointed out, that there is an ethical frontier: explicit depictions of violence against children – in this case even against babies. I do not want to break any discussion of principle, so let me just say: it is not a pointless, forceful demonstration of violence! This is not some regular Revenge-Torture-Novel, this is a vendetta, as it could hardly be more relentless! If this fact now influences the individual ethical principle, everyone must decide for themselve. The morbid naturalness of Ryan Harding’s Genital Grinder, combined with the adversity of Jack Ketchums The Girl next Door (Warner Books, 1989), expands with the violence of Tim Millers Hell, Texas (Selfpublishing, 2013) and silently embedded in purgatory. The potential of violence of this work is physically and psychologically at an incredibly high level – the sexual assaults of the father (and the inactivity of the mother as a consequence) represents just the sugar-coated topping. The famous frontier "children" is exceeded several times, the extravagant representations of the inevitability do the rest. The story about Hillary has gained with this book, an incredibly repulsive, but also a (sometimes extremely reluctant) dramatic component.